LOS ANGELES — A dog on a finger. A hummingbird behind an ear. Mickey Mouse on a wrist. These intricate, unconventional tattoos are the handiwork of Brian Woo, a 33-year-old tattoo artist in Los Angeles with a huge following on Instagram(more than 320,000) and a string of celebrity clients including Drake, Ellie Goulding and the actress Sarah Hyland. Quick-witted and eminently chill, able to render all manner of subjects with a level of detail that might have made M. C. Escher raise an eyebrow, Mr. Woo (friends and fans call him “Dr. 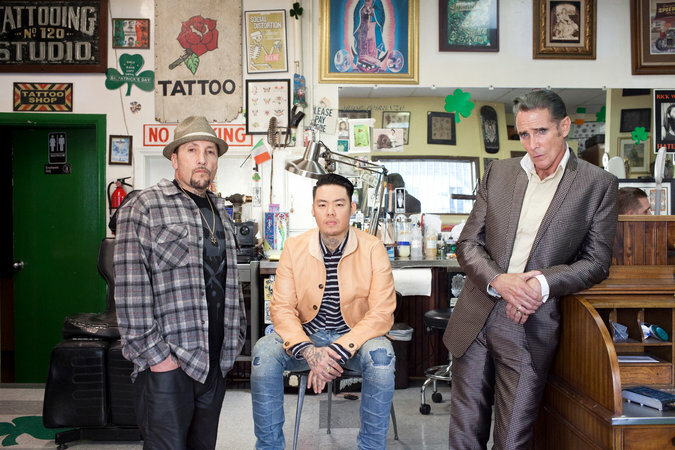 Woo”) has become an in-demand tattoo artist for the Hollywood set. To sport his signage is to be at once trendy and timeless. Word of mouth and the glow of Instagram have helped Mr. Woo drum up a monthslong waiting list at the Shamrock Social Club, the venerable tattoo parlor in West Hollywood where he works. “But it was Woo making appointments for next year, and people wanted to come in person to do it,” he said, shaking his head in disbelief. To hear Mr. Woo tell it, he is simply following a tradition taught to him by veterans like Mr. Mahoney, who gave Mr. Woo one of his first legal tattoos at 18. At this point, Mr. Woo has so much ink — an anchor on an earlobe, the word “cope” written in cursive on his neck, a 1952 photograph of his Taiwanese grandfather on his arm — that he can’t remember what, exactly, was his first legal tattoo. After high school, he tried community college but paid more attention to partying, skating and going to concerts. He was managing a clothing boutique and toying with the idea of creating a skateboarding-inspired clothing line when Mr. Mahoney suggested he apprentice at his shop. Mr. Woo spent about three years apprenticing (scheduling appointments, cleaning the bathroom, watching Mr. Mahoney and other artists work) before he touched a machine. Around that time, he picked up the nickname “Dr. Woo” from a regular. “My dad always wanted me to be a doctor,” Mr. Woo said. While Mr. Woo will tattoo just about anything, clients often see his work on Instagram and ask for their own versions. A compass-like arrangement of circles, arrows and dots is particularly popular. The doctor sometimes takes on a therapeutic role, letting his clients vent as the needle does its work. He isn’t fazed by celebrity (famous clients, he pointed out, sit in the same chair atop the same linoleum floor as everyone else), though he’s able to gauge star power based on a certain type of pre-inking angst. SEE THE ONLINE VERSION WITH IMAGES HERE.